I’m a big fan of eating what is in season, which means here in Seattle rhubarb from my garden and strawberries from California are ready to make a debut in my kitchen. Since my rhubarb was going crazy in the garden, I decided it was time to make something delicious out of it. My husband was giving me some hints as well. 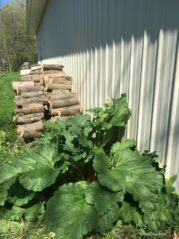 I was first introduced to rhubarb in my paternal grandmother’s garden. However, the extent that she would use it was combining it with Strawberry Jell-O. It was delicious when I was a child, but my palette has grown quite a bit since that time and craves pies, crumbles, and crisps over gelatin. 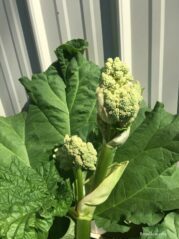 2700 years ago, rhubarb first appear in traditional Chinese medicine as the roots were thought to be a laxative and was one of the first Chinese medicines to be sent to the West. The leaves of rhubarb contain poisonous substances containing oxalic acid, which can do great damage to the kidneys. Humans were poisoned during World War I when Britain recommended the leaves as a food source. The reason the petioles (or stalks) are edible is that the percentage of oxalic acid is much smaller. 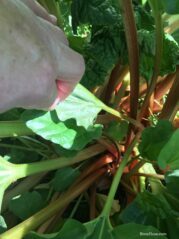 For children in the UK, tender stalks of rhubarb dipped in sugar were a common treat in days past. This is still common in western Finland, Norway, Iceland, Sweden as well as other parts of the world. I’ll have to give this a try! 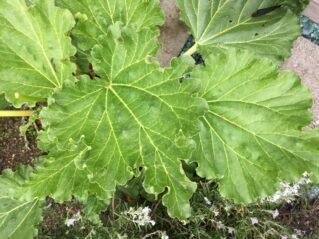 Not all rhubarb has red petioles (stalks), my rhubarb has green, but there is also some that are light pink. Now let’s move along to the main event – Rhubarb-Strawberry Crumble! Vanilla Ice Cream, optional, but not in my opinion! On stovetop, place rhubarb, strawberries, sugar, zests in a saucepan. Dissolve the cornstarch in a bit of juice from the orange – taking care there are no lumps – then add to saucepan. Heat over stove until mixture starts to thicken and rhubarb becomes tender. This is the time to taste test and see if more sugar is needed to make it sweeter for your taste or cornstarch is needed to make it thicker. Depending on the water content in the fruit – more cornstarch may be needed. 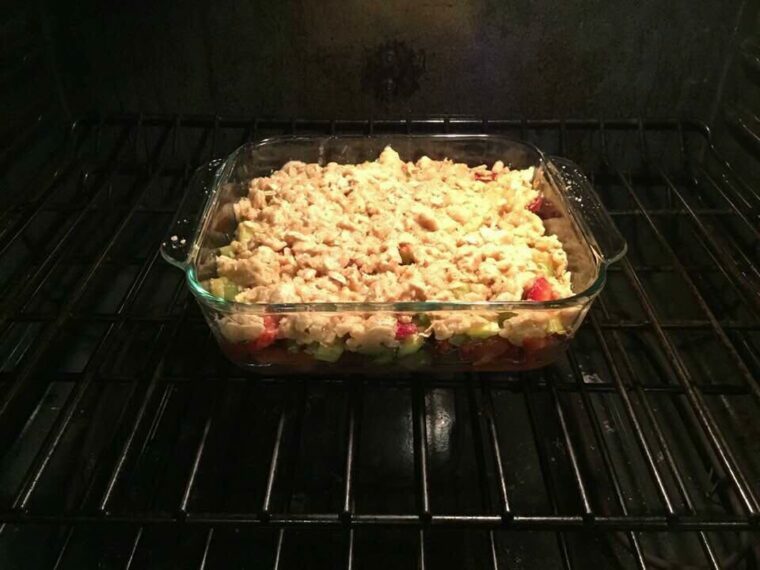 While your fruit mixture is working on the stove, start preparing your crumb topping. Combine flour, brown sugar, salt and butter in the mixing bowl. With a fork or your fingers, press the mixture together until it all becomes incorporated. This can be done in a food processor as well, if preferred. Recommend tasting this mixture as well to see if it meets your liking – if not, add more sugar or salt. Some spices would be lovely as well such as cinnamon or fresh ground nutmeg, but absolutely optional. Once your fruit and topping are ready, place in an 8-inch x 8-inch Pyrex dish. Placing fruit on the bottom and then crumbling your flour mixture over the top. Next place in your 350-degree oven for about 25 to 35 minutes. At this point, you are only baking and browning the crumb topping since your fruit is already soft (or to the texture consistency that you prefer). Let cool for 10 to 15 minutes – then dish up with a side of vanilla ice cream and let the spring food celebration begin. I made it easy for you to share this to Pinterest by creating the image below! I would love to hear from you so be sure to comment below and tell me what you think of rhubarb. DO you grow it? Did you try this recipe? Don’t forget you can reach out to me and write a personal note on my contact page featured on this site. I love rhubarb. My mom made rhubarb sauce, crisp, pie, and jello/rhubarb jam (easy freezer jam) from the plants in my parents yard. 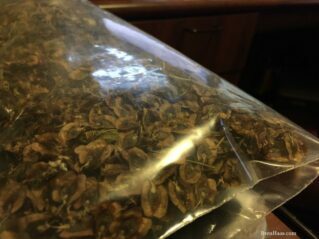 Now they bring a bag full when they visit in the summer?. A note on the recipe, if you mix the cornstarch with icy cold liquid you’ll never have lumps. Sometimes I throw in an ice cube until it’s incorporated and remove the ice before I add the corn starch slurry to the other ingredients. This sounds delicious Danielle! Thanks so much Jen! I love getting new cooking tips! So helpful – I typically always use water from the frig dispenser so it is cold already, but will add an ice cube from now on. I hope you will try the recipe. 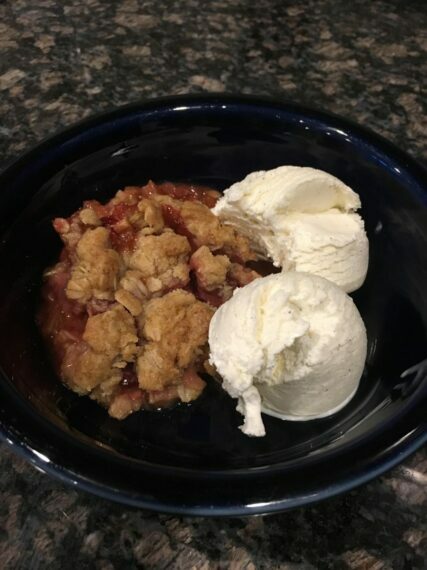 Rhubarb reminds me of my grandma as well but she only would use it mixed in strawberry jello topped with miracle whip, which is quick, easy and good!